When Peter Wohlleben began his life as a forester, he knew only what the modern forestry industry needs, i.e. to produce lumber it fells trees and plants new seedlings. 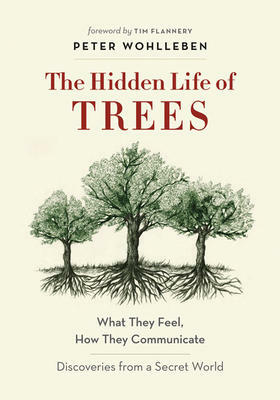 As his career progressed, he got closer to the life of the trees themselves, discovering that they produce electrical impulses that pass through their roots and in this way communicate with their neighbours. This includes their child-saplings and the fact they can feed them sugar and other nutrients. Wohlleben has spent some time at a forest he manages in the Eifel mountains in Germany. In recent years Aachen University began conducting scientific research when it was realized that forests develop differently and more effectively when left to their own devices than when used merely for commercial gain. They need to communicate with each other, one of the most important ways to stay connected is a “wood wide web” of soil fungi that connects vegetation in an intimate network. Peter Wohlleben spent over twenty years working for the forestry commission in Germany. He now runs an environmentally friendly woodland, working for the return of primeval forests. He has written a number of books about trees. This is an astonishing one and takes the reader into a brand new world.